A community for technology geeks in Lebanon. Ogero is finally giving unlimited download at night! The ministry of telecommunications announced this after adding another 10 GB to Lebanon's 23 GB international bandwidth. Though it didn't specify if it's for all regions or a select few, this is actually more important than the last speed upgrade, yet strangely I can't find a single article or even a comment about this anywhere on the web. I thought everyone was crying out for unlimited internet(well torrent and magnet users were anyway), yet nobody seems to care now that it happened? Finally! when will it start? EDIT: Ok found this site, but I didn;t understand much, will they add 10 gb bandwidth? Will the unlimited traffic will be only for the 122,000L.L. subscribers? No it will be for applied for all speeds, including the lowest 24,000 L.L 1Mbps plan. More than that I haven't got a clue. Hmm, from what i know, Ogero has the best Pings of all ISP providers right ?! If that is correct, and with the new unlimited night traffic .. Prepare for a Huuge croud of customers Ogero..! That sounds good in theory, but if this were to happen, other ISP's who are losing customers, would start having better ping rates while Ogero who is going to be taking on all of these new customers, will have a deterioration in performance. It will sort itself out eventually, though. Hopefully it will never be applied. Hopefully what will never be applied ?! Lets hope it get signed..
Ogero subscribers say goodbye to QoS. What about Visp subscribers is it confirmed or not is it an official company I'm downloading from 3am till 7 am 4 hours using torrent magnet Url but can't get an accurate speed 1Mb/s i think visp lately shaped torrent ports from 10000 getting a 100MB in 1 hour with 256Kb/s i dont know why visp shaped those ports??? now why would you hope that? 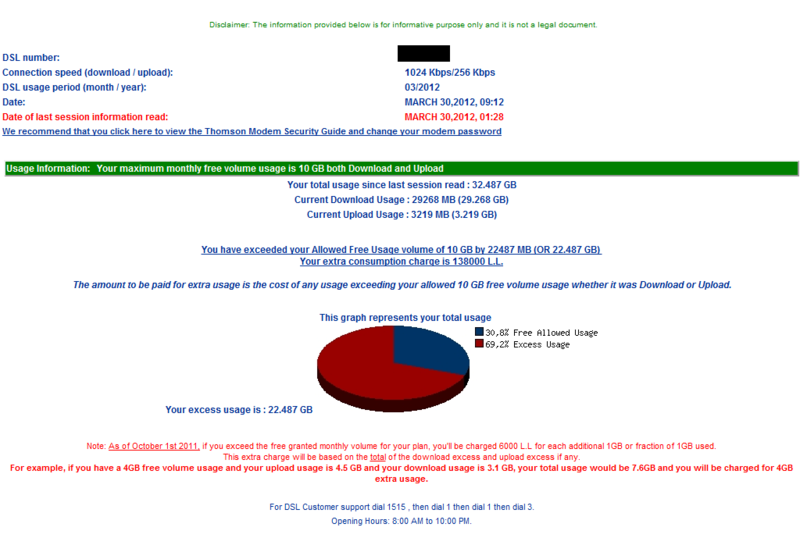 You cannot possibly consume this amount of bandwidth with regular usage. Are you sure your LAN is not cracked by some neighbor of yours? I have mixed feelings about it too--I want the extra quota, but when it becomes a free for all, it doesn't usually work out for the end user. I wish they would have doubled the quotas for example, until at least the bottlenecks in the network are worked out. Raficoo--is the 10 gig plan available in your centraal--that costs 32K and gives you more quota to work with and maybe reduce your overages? Unlimited Night Traffic means only one thing: Everyone is abusing the bandwidth. I myself, do not consume much per month but when I do, I want my connection to be of great quality. I used to get that with Ogero, but as of a few months ago (hint: decree) I haven't had any decent service whatsoever. The difference between Ogero and other ISPs was that Ogero did not provide Unlimited night traffic. If this passes, you may as well kiss all your online gaming goodbye. I beg to differ. In 90% of countries of the "civilized" world they have unlimited quota 24/7, and their gaming latency is always adequate for gaming. No matter how much you beg to differ that my logic doesn't apply outside Lebanon, my statement holds correct, granted, well we do live in Lebanon. Everyone uses the internet for his own needs, I myself do not need unlimited quota, neither night or 24/7. All I want is a decent connection where my speed wouldn't drop to 3KBps at peak hours. My days of "I want to download the Internetz" have ended at least 10 years ago. You do forget that a fraction of the users fully utilize their unlimited bandwidth at night. Not all people are going to be downloading at full speed for 7 hours every night. For example, IDM used to justify 4GB of quota by saying that 90% of users use less than their allowed quota. Since they were catering for the majority, then they saw 4GB as reasonable. However, requirements change. I am a heavy downloader and I don't always have something to download at night. Especially when you have higher speeds, you would be able to download what you want in the first few hours. I am with Xterm on this. What allowed Ogero to keep QoS was the fact that they didn't have unlimited downloads and double speeds. I am also not someone who cares about downloading. I care about low ping and connection stability. Xterm, don't you think the QoS will stay the same at Ogero until 12:00am hits ? I mean maybe the pings will get higher only between 12:00am and 7:00pm. Outside that interval, things could remain the same as now. I personally always consume my monthly quota. No matter how large it's going to be, I'll always consume it. But I also control my usage to exactly what I'm allowed to consume (my free quota). In the past, I used to cross the limit by a maximum of 1-2 GB, but I haven't in a long while. When I have something I really need to download, I usually ask one of my friends with unlimited night quota to do it for me. But that usually happens once every 2-3 months (whenever there is an interesting event by Microsoft, such as MIX11 or TechDays). Other than that, I'm totally fine with my 2Mbps / 20GB connection, so yeah I am with xterm and I have the same concerns if that decree passes. The unlimited night traffic is really not worth it if it's gonna ruin the connection. It's far from enough for someone who really needs a lot to download. Still I think very few people play online games after midnight; at least my wow guild didn't, we always finished at 11:30. There are tons of stuff that I can only watch online but I just have to let go. I currently consume 20GB per month with my brother WITHOUT downloading any of the major shows I would have liked to watch. Watching starcraft2 shows and streams needs around 30GB monthly. We don't even download the t.v. series we watch like family guy, or game of thrones (second season coming next month), we just buy them from some dvd shop on demand (I don't know from where this guy gets his internet). This is all without taking into account the anime (japanese cartoon) I'm currently following or those I would have liked to watch. I've actually stopped watching some really good anime shows after coming to Lebanon. The real problem in Lebanon is that there is no real demand for a good internet connection. Most people are satisfied with what they have and have no real need for bigger quota. As DG pointed out, the service MAY be affected only during the time unlimited downloads is allowed. Sodetel, if I'm not mistaken, combats this by FUP, slowing down the heavy users to a still fast enough speed. The problem with latency in all other ISPs, at least during the day, cannot be related to offering unlimited downloads. Even if bandwidth was suffering during the day, there's no reason why it should suffer during the night. Even in that case, unlimited downloads can still be offered.